This basket's unusually wide shoulder and flat lid suggest it was modeled after Chinese porcelain but using geometric patterns and weaving techniques characteristic of Chumash traditions. By the 1820s, Spain had established coastal missions to colonize and Christianize indigenous communities that were important trade centers for ships traveling between the Pacific Northwest Coast, Hawai'i, and China. 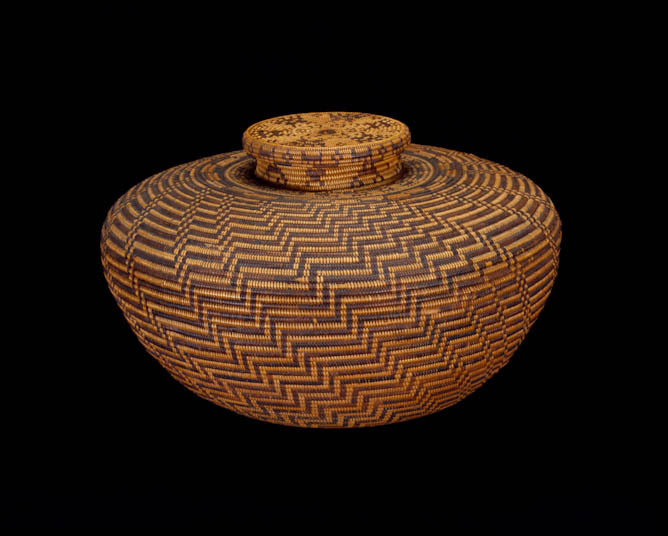 Chumash weavers capitalized on this market, creating basketry that blends nontraditional forms with Native aesthetics.